Carmen Sirianni is also Faculty Fellow at the Ash Center for Democratic Governance and Innovation, John F. Kennedy School of Government, Harvard University, where he has also served on the review team for the Innovations in American GovernmentAward, commonly known as the "Emmy in American government." He is an elected fellow of the National Academy of Public Administration, and served on the advisory board of the Journal of the American Planning Association. He has also held research appointments at the Institute for Advanced Study in Princeton and the Minda de Gunzburg Center for European Studies at Harvard. Sirianni is currently working on one main book project. Sustainable and Resilient Cities in American Democracy. He examines the emergence and development of the sustainable cities field from 1945 to the present, utilizing analytic frameworks from institutional fields, civic and professional associations, social movements, urban and environmental governance, public policy, and democratic theory. He also explores how this field might become more robust in the face of the challenges ahead. 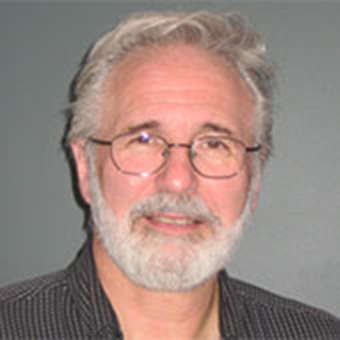 Sirianni was also co-lead (with Kenneth "Andy" Andrews and Dana Fischer), Sociological Perspectives on Non-State Actors in Environmental Governance, National Socio-Environmental Synthesis Center (SESYNC), University of Maryland (funded by National Science Foundation). He also contributed to the "Inclusive, Participatory, and Collaborative Governance as a U.N. Sustainable Development Goal," guidance for U.N. vote, Fall 2015, U.S. compliance, convened by the Open Society Foundations. As an engaged scholar and public sociologist, Sirianni drafted (with Harry Boyte) the civic engagement framing document within the Obama '08 urban policy committee and then coordinated its collaborative governance workgroup. He consulted on the Open Government National Action Plan. In July 2013, he coordinated the workshop at the White House (with Tina Nabatchi, Maxwell School, Syracuse University) on scaling local innovations in open governance. He has served as senior advisor to the National Commission on Civic Renewal, as well as in various advisory roles at the U.S. EPA's Community Action for a Renewed Environment Program, Center for Information and Research on Civic Learning and Engagement (CIRCLE) at Tufts University, National Civic League's All-America City Awards, PBS Democracy Project, City Year, and many other civic organizations and national initiatives. He also co-directed the Pew Charitable Trusts policy and practitioner conferences on youth civic engagement. He served as research director of the Reinventing Citizenship Project, convened by the White House Domestic Policy Council during the Clinton administration, with support from the Ford Foundation, and in partnership with the Humphrey Institute at the University of Minnesota and the Walt Whitman Center for the Culture and Politics of Democracy at Rutgers. With support from the Surdna Foundation, he developed (with Lewis Friedland and Brandeis Ph.D. Melissa Bass, as well as leaders of major civic organizations) the first web platform for civic innovations across a broad range of fields and organizations in the U.S. (Civic Practices Network), which was the most widely utilized website on civic renewal for its ten-year history. In 2011, Sirianni's presentation on youth innovation in Hampton, Virginia (a finalist for the Reinhard Mohn Prize) was featured in a conference hosted by Germany's largest foundation, the Bertelsmann Stiftung, in Berlin with leaders from the three major parties in the Bundestag, as well as various heads of German federal agencies and state governments. The Friedrich Ebert Stiftung, in collaboration with the history department at Fudan University in Shanghai, sponsored his talk on universities and democratization as part of an international symposium, though the Chinese Security Police intervened in the proceedings to challenge his presentation, to which he offered a spirited public response. Sirianni has periodically taught the junior tutorial on Civic Engagement and Community Empowerment, as well as supervised numerous senior theses, for the Committee on Degrees in Social Studies honors concentration at Harvard, where he was awarded the Thomas Temple Hoopes Prize for Excellence in the Work of Undergraduates and the Art of Teaching. Sirianni has published earlier books and articles on European labor movements, workplace participation, women's organizations, working time innovation, and political and social theory. He edited the 45-volume series (with Paula Rayman), Labor and Social Change, for Temple University Press. 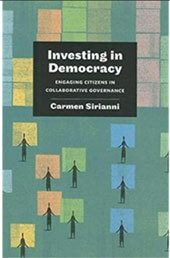 Sirianni is author of "Investing in Democracy: Engaging Citizens in Collaborative Governance," (Brookings Institution Press, 2009), which examined the role of public institutions in community engagement, as well as rationales and forms for making public investments in capacities for collaborative governance and civic partnerships. 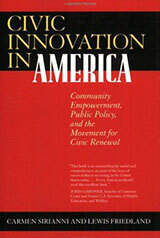 In Civic Innovation in America (University of California Press, 2001), with Lewis Friedland, he analyzed innovation across four fields (community organizing and development, civic environmentalism, healthy communities, and public journalism), as well as the emergence of a broad civic renewal movement in the 1980s and 1990s. Sirianni’s edited book with recent Brandeis PhD Jennifer Girouard, Varieties of Civic Innovation: Deliberative, Collaborative, Network, and Narrative Approaches, was published by Vanderbilt University Press in 2014. A long selection from his book, The Civic Renewal Movement (with Brandeis PhD Lewis A. Friedland, now Vilas Distinguished Professor at the University of Wisconsin-Madison) was published in Chinese and English by the Chinese Academy of Social Sciences and the Kettering Foundation. "The Civic Renewal Movement: Community-Building and Democracy in the United States," (Kettering Foundation Press, 2005). 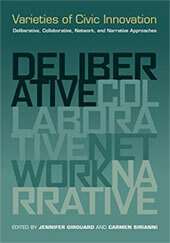 "Working in the Service Society," (with Cameron Macdonald, ed., Temple University Press, 1996). "Working Time In Transition: the Political Economy of Working Time in Industrial Nations," (Temple University Press, 1991). "Worker Participation and the Politics of Reform," (Temple University Press, 1987). "Critical Studies in Organization and Bureaucracy," (Temple University Press, 1984, revised edition 1994). "Work, Community, and Power: The Experience of Labor in Europe and America, 1900-1925," (Temple University Press, 1983). "Workers' Control and Socialist Democracy: the Soviet Experience," (Verso, 1982). "Bringing the State Back in Through Collaborative Governance: Emergent Mission and Practice at the U.S. Environmental Protection Agency," in Jennifer Girouard and Carmen Sirianni, Varieties of Civic Innovation: Deliberative, Collaborative, Narrative, and Network Approaches, Vanderbilt University Press, 2014. "The Civics of Urban Planning," The Oxford Handbook of Urban Planning, eds. Rachel Weber and Randall Crane. Oxford University Press, 2012, pp. 669-90, with Jennifer Girouard. "Environmental Organizations," in Lester M. Salamon, ed., The State of Nonprofit America, second edition. Washington, DC: Brookings Institution Press, 2012, pp. 294-328, with Stephanie Sofer. "City Government as Enabler of Youth Civic Engagement," in Policies for Youth Civic Engagement, edited by James Youniss and Peter Levine. Nashville: Vanderbilt University Press, 2009, pp. 121-63, with Diana Schor.